One of the largest PPC marketing platforms in the world, Google Adwords, now known as Google Ads. As of now approximately 90% of Google’s revenue comes from online advertising. Google is at the forefront when it comes to a comprehensive marketing platform, and is now the most widely used online advertising tool. Google Ads work on a pay-per-click model allowing users to place a bid on keyword phrases for selected positions within Google search pages, the highest bid will get first position on the page and the second highest bid, second place etc. This bidding format makes it easier when setting up campaigns by providing exact cost per click pricing for selected keyword phrases, allowing businesses to set limits as well as a daily spend threshold. Each time a web surfer searches using a keyword phrase the company whose bid value is the highest for the placement will be shown at the top of the page. 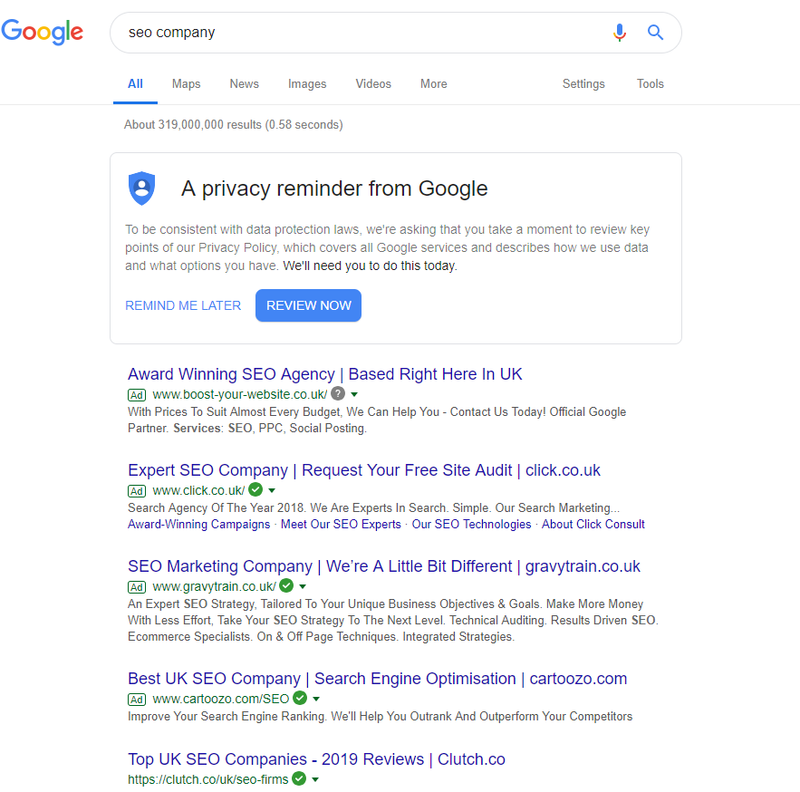 This means there could be potentially 18 results shown on a page of which 8 could be ads placed by Google, this leaves space for ten organic results which are added by Google, (FREE Organic Search). Ads that most closely follow a user’s search pattern will be shown at the top of the page. The adverts are shown on a page in ascending order according to the price paid and the relevance to the user. This is why it is incredibly important to purchase keywords that closely match products and services you provide in order to convert paid clicks to your website into paying customers. The actual process of how an advertisement is placed will be dependent on a metric, known as Ad Rank. It is calculated by multiplying two separate factors. The first factor is cost per click, which means the highest amount of money paid for a click; the second factor is the quality score of your website. The score quality depends on your advertisements click-through-rate, the relevance and the useful quality of the landing page. The Google Ad system will align your advertisement with people using the Google network, this rating and ranking system is much like an auction system, by choosing the best keywords whilst providing relevant landing pages with good quality content is essential when using Google Ads to its best potential. Maximise the results of your advertising campaign by having good keyword relevance, optimised high quality landing pages, persuasive sales pitch relevant to the searchers needs. Choosing the right keywords for your campaign can be time consuming and must be built around keywords that will bring success in terms of sales and profits. As an advertiser it’s in your interest to monitor and refine your advertising phrases using only the most relevant. You may be missing out on hundreds of valuable low-cost keywords that could be pumping traffic to your website. You should have an exhaustive list of keywords that focus on your niche. Try a list of long-tail keywords that cost less money and are more product or service specific. You also want to have an expansive list that is constantly growing and changing based on the results of your marketing campaign. The last process of running a successful PPC campaign is to manage it properly. By regularly monitoring your account and analyzing the performance of your chosen keyword phrases and the results they achieve. Be sure to constantly add PPC keywords that are relevant to your website, remove negative keywords that do not bring positive results wasting both time and money. Split your advertising groups to maximize click-through rates and improve your quality score ratings. Review PPC keywords that are expensive and analyze whether or not they are worth the spend rate (Do your Sums). Lastly, always be sure to refine and test your landing pages. Make sure that your landing page has a strong call to action and is relevant to the keywords that you are advertising through Google PPC. There are many different elements that will either make a PPC advertising campaign a success or failure. Follow the advice and strategies as listed above to maximize the chances of success in gaining a higher return on investment (ROI) with Google Paid Ads.